Historically, this has not been something worth writing about. But today was different. Today was the first time in my life that I cut the grass and could hear myself think. The first time I could smell the fresh-cut grass as it was being shortened without breathing noxious fumes. The first time I didn't spill gas all over the place while filling my carbon dioxide spewing machine. 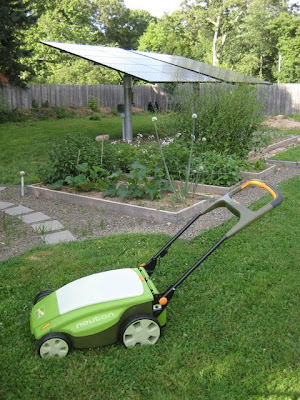 Enter my new Neuton CE 6 battery-powered lawnmower. It's quiet, maneuverable, and fun-looking. Is it a super powerful manly man beast of a machine? Of course not. I could care less about all that. Then again I am the kind of man that is not impressed by a Hemi, Hummer, or hog. However, as I mowed under the solar panels that had charged the batteries running this new clean cutting machine, I did have a growing sense of getting somewhere. Lawnmowers are far worse than cars when it comes to polluting, and I am happy to have eliminated that portion of pollution that had been coming out of my yard. I am so looking forward to the next generation of automobiles that are 100% electric and are charged at peoples' homes, where photovoltaic cells and small wind turbines are commonplace and no longer the exception. It seems that with the right people making the right decisions, that future doesn't have to be too far away. Nice. Do you just charge it the night before you’re planning to use it, or do you need to keep it plugged in all the time? And how long will it go before it needs to be recharged? Thanks Steve! Adrian, The mower came with one battery that is good for 1/3 acre. I bought a backup battery at the same time since I wasn't sure about longevity and would hate to run out halfway through. With that said, I charged up both batteries and by the time I was done mowing my whole lawn and done all the edging (with an optional attachment for the mower), the first battery was still half full. I'm sure over time the capacity will decrease, but Neuton says the batteries are good for 3-5 years and after that are recyclable. I'm hoping that by rotating between two batteries I'll get a longer life out of both of them. So, no you don't leave it plugged in all the time. The first charge needs to be 24-72 hours and then subsequent charges I believe are for 24 hours. Looks like a great lawnmower.